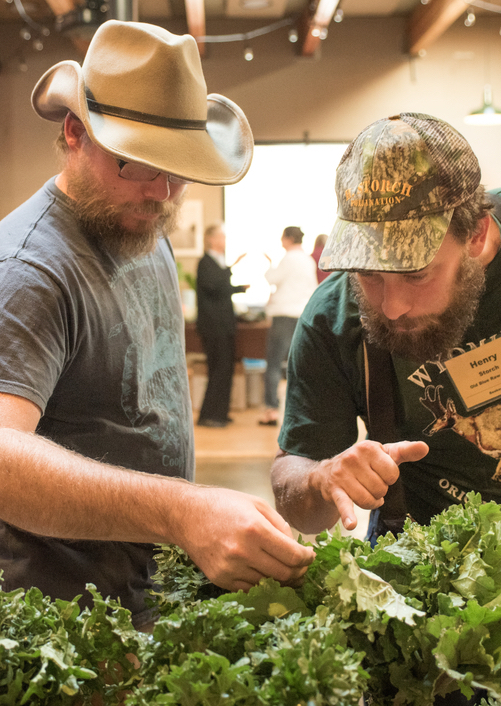 It's incredible that no one had thought of it before: bringing chefs together with farmers and seed breeders to collaborate on growing more flavorful ingredients. Fortunately we have a visionary in Lane Selman, an agricultural researcher at Oregon State University, who had the idea to do just that. 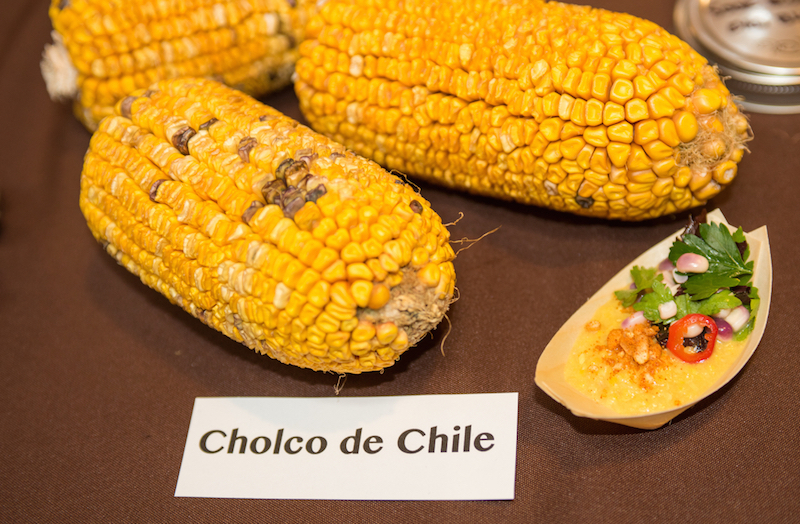 This is the second year she has organized the Culinary Breeding Network's Variety Showcase, a tasting and evaluation of new vegetables bred as a result of these collaborative efforts. Here is Slow Hand Farm owner and consultant Josh Volk's report on the evening. Photos courtesy of the incomparable Shawn Linehan. 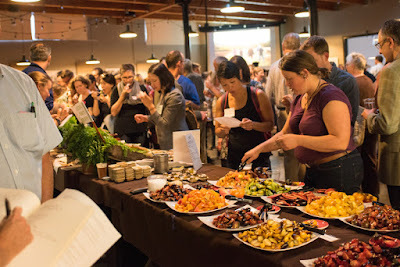 Monday night was the Culinary Breeding Network's 2nd Annual Variety Showcase in Portland, Oregon. 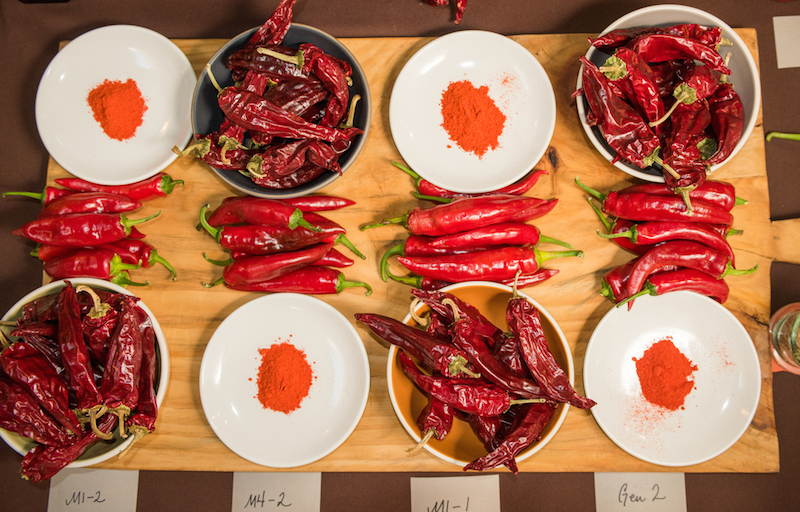 The event brings together seed breeders working on varieties for organic production, farmers and chefs to highlight the work that they are all doing to promote new and special vegetable varieties. Lane Selman, the organizer and force behind the Culinary Breeding Network, does an incredible job of bringing seed breeders from all over the country and pairing them with chefs who can prepare their vegetables and give a sense of their potential. 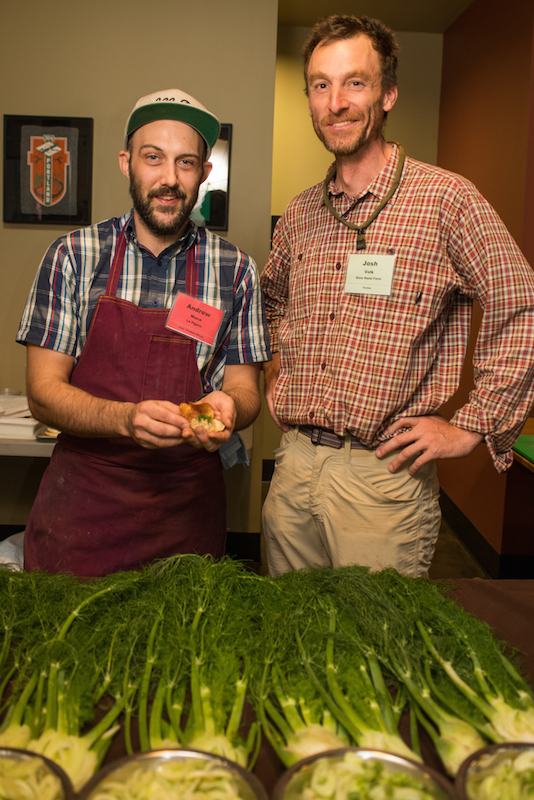 Farmer Josh Volk (r) with chef Andrew Mace, Le Pigeon. The format for the event is pretty simple: seed breeders and/or farmers are paired with chefs who will work with the farmers' vegetables to prepare a tasting. On the night of the event, tables are set up with displays of the vegetables alongside raw samples, as well as samples that the chefs have prepared. Then the room fills with journalists, chefs, farmers and seed breeders. The big crowd of about 200 sampled the goods and talked with the chefs, breeders, farmers and each other about what they were tasting. Samples of a sweet paprika and Hungarian Black pepper cross. As a farmer, I’ve been working with Lane on vegetable projects for about ten years now and she’s always included tastings in the work that she’s involved with, not forgetting the importance of flavor when choosing varieties. We’ve worked together on countless crops, mostly doing trials under organic production methods to look at their potential for yields, disease resistance, storage, cold tolerance, etc., but always also looking at flavor. In all of these trials we’ve been comparing new plant material from seed breeders alongside commercially available seeds. Andrew Still of Adaptive Seeds (l) and Henry Storch of Old Blue Raw Honey. About seven years ago she started inviting chefs to be a part of the conversation, and the synergy is incredible. Now, at the Variety Showcase, we have all three groups in the same room at the same time. As a farmer I’m able to talk to the breeders about what characteristics I’m looking for, and to the chefs about what they’re looking for. They also give me ideas about new crops, new techniques and new marketing avenues, and I get to see, touch, smell and taste the products right there. I had a great time catching up with friends from the food world and getting inspired by new crops and incredible preparations of old crops that give me new ideas. Non-sweet vegetable corn from Bill Tracey, UW-Madison. I was tabling with Andrew Mace from Le Pigeon and Shaina Bronstein from Vitalis Organic Seeds. With Our Table Cooperative I’ve been growing fennel trials so we had six to sample at the table, and Andrew had made a take on chips and dip with the fennel that was delicious. I didn’t have a chance to make it around to all of the other tables; every time I’d go out to try to see what was out there I’d run into someone I wanted to talk to and then spend all of my time on just one or two items, but I did get to see most of it. Plus I got to talk to a lot of people about fennel and what I’ve noticed while growing a dozen different varieties side by side this year. In the mix of crops being highlighted were carrot breeding lines, sweet corns—or perhaps more accurately vegetal corns which are sweet but also have amazing corn flavor and are meant for fresh harvest—really exciting work on American groundnut (Apios), winter squash, many different peppers and beans, winter melon, barley, wheat, shiso, parsley and probably a handful of others I either missed or didn’t get a chance to see. This event in some ways is showing food at an exclusive craft level, but in typical Oregon style, it is anything but elitist. The emphasis is on featuring the vegetables and moving our food system forward using organic techniques, while celebrating the breeders who are making this possible and raising everyone’s level of understanding and creating positive connections. To see more of the fun, check out Shawn's gallery of photos.